3BR / 3BA Oceanfront Cliffside Villa à l'extrémité ouest de Negril..Grande véranda enveloppante couverte avec tables et chaises et un lit de jour de taille double pour votre confort menant à une grande terrasse et des escaliers vers l'océan..Grande piscine et snorkling dans la piscine privée cove..Emazing couchers de soleil tous les soirs .. Cuisine complète. Chaque chambre dispose d'une salle de bain complète en suite. Villa peut accueillir jusqu'à 6 personnes. Les beaux jardins et grands brises. Toutes les chambres ont des ventilateurs de plafond. Situé à 1 mile du centre de Negril et la meilleure plage de 7 mile dans les Caraïbes. La distance de la célèbre Ricks Café Walking. Service de nettoyage et les services fournis cuisson moyennant un supplément. Les transferts aéroport et des excursions disponibles moyennant un supplément. My husband and I spent an amazing 4 weeks at the Villa and didn’t want to leave..The property is very private with its own gated yard and a large veranda overlooking the ocean with a fabulous swimming cove for swimming and snorkeling and the sunsets every night are amazing!! The Villa comes with snorkeling equipment.. The property was very safe..Fabi the Gardner is there everyday if you need anything and Ronald and Rankin the nighttime security were also very helpful.. The Villa is large with 3BR & 3 BA..The rooms all have ceiling fans with lots of windows for cross ventilation..Not to mention the sea breeze coming off the ocean..
Fabi grilled chicken, fish and lobster for us several times and it was delicious.. There is room for 2 vehicles inside the gate..
Property is very private with a gated yard that accommodates vehicles parking.. Very comfortable accommodations great private swimming/snorkeling cove property is well located for bars restaurants and convenience stores..A ten minute car ride to Negril fabulous 7 mile beach..
Staff is very helpful both daytime and nights.. The cliffside location of this villa can't be beat! We greatly enjoyed snorkeling off the cliffs here and there were several good restaurants within walking distance. We loved the fried chicken at Pablo's and the jerk chicken fettuccini at Caio Jamaica was amazing! Xtabi was also a nice location for brunch. We rented a car for the week, which I would highly recommend. I would not recommend or count on using Fabi or any other staff here to make arrangements for you. Like most locals they are simply trying to get money from you and he does not have a car. We also had a very difficult time understanding what Fabi and Runkin were saying to us. We had a problem with a broken faucet and despite many promises, it was never fixed. The furnishings are very dated, but the beds were comfortable. There is literally no food here - so bring your own coffee and sugar. We only saw Polly the night we checked in and no offer of cooking for us was ever made. You're on your own here. Just returned from a weeks vacation and the villa and property are both perfect. The views from the porch are breathtaking. Easy access down to the sea, the owner also provides snorkel gear to explore the cliffs. The staff are always available to help you with whatever you need and are always there for great conversation. Can't wait to return! This place is in a GREAT location. Very secure (with guard) and comes with a housekeeper (Ms Polly). Cliff in back is EVERYTHING. House even provided snorkel gear for those that wanted to utilize. There were 7 of us and we truly enjoyed the home. This is a great location and friendly staff. My only downside was that there is no A/C.. But the owner provided fans in each room. Favorite part: the amazing cliff that u can go down into by stairway/ladder. We stayed at this great villa last week of June, first week of July. The good: great location for swimming, snorkeling, and lounging. It's close to town, and the team that keeps the house does a great job to make sure you have a great time. 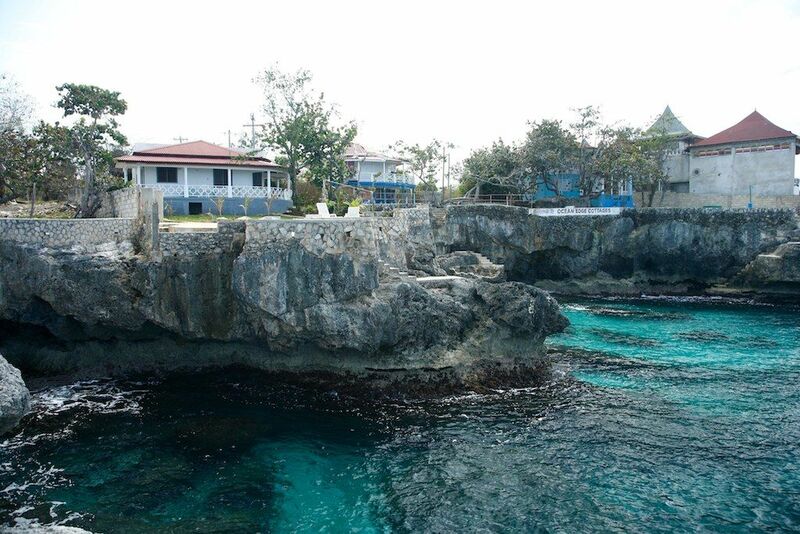 The not so good: most of the ocean from villas in Negril are close to the main road. This leads to some traffic noise at night. It is an open concept house with plenty of ceiling fans (no ac). Keep that in mind, it can get hot in the earnings if the wind dies down. Overall we had a lot of fun at this villa. A special thanks to Fabi, the groundskeeper, that made us feel at home and safe at all times. Stay here if you want a taste of authentic Jamaica! 90 min de l'aéroport de Montego Bay, 20 min par Air à Negril.